A fine little Hermes Baby with an uncommon deluxe case that beckoned to me, but I resisted - especially once I found out that the space bar would not move the carriage, even with the drawstring seeming intact. It might have been an easy fix, but I'll leave that for someone else to figure out. This is what the top of the case looked like, in case you have not yet come across one of these deluxe Babies yourself. 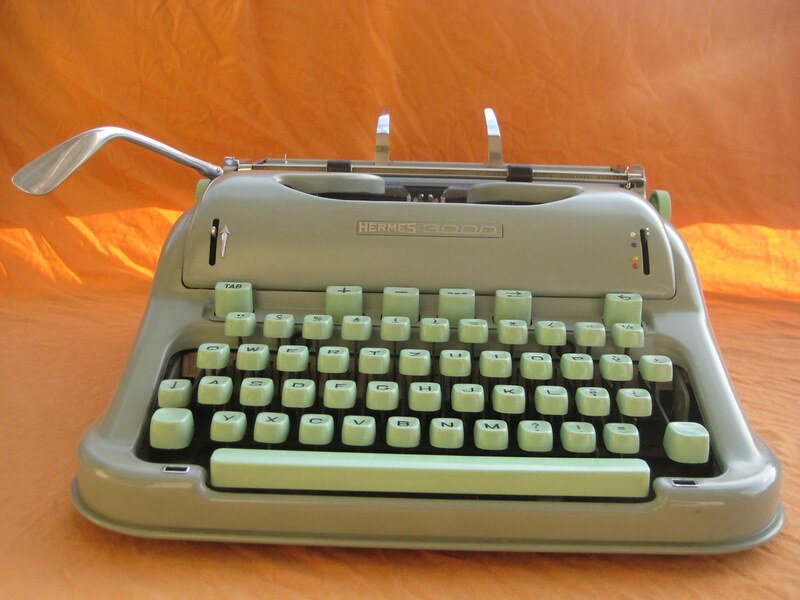 A sort of pebbled, faux leather covering, probably meant to match the mint green of the typewriter when new, but now faded and dusty. On a cloudy Sunday in July we ventured off to Nyon, which has a monthly flea market I am only now discovering. Worth the fifteen-minute train ride to see a few times a year, I think. Not many typewriters, though. And a cheerful yellow Japan-made Brother Deluxe 800 (also the same age, I would imagine). Yellow Brothers turn up often around here; just a few weeks later, we sighted this one (re-branded M-Office 1800) in a local thrift store. Almost identical but not quite: a different shade of yellow (or maybe it was just the poor lighting), and the ribbon cover/ general shape is really quite different as well. Features seem identical, however. 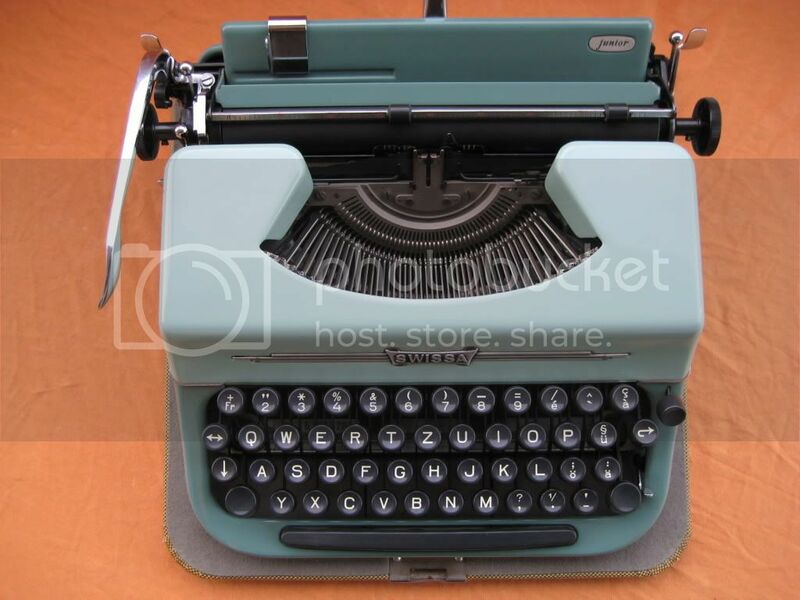 Also in the thrift store was this gorgeous minx - an Olympia Splendid 33 with the cream-and-turquoise color scheme I am so fond of from Olympia. So very tempting, but ordinary pica does not particularly inspire me these days, so I stood firm. 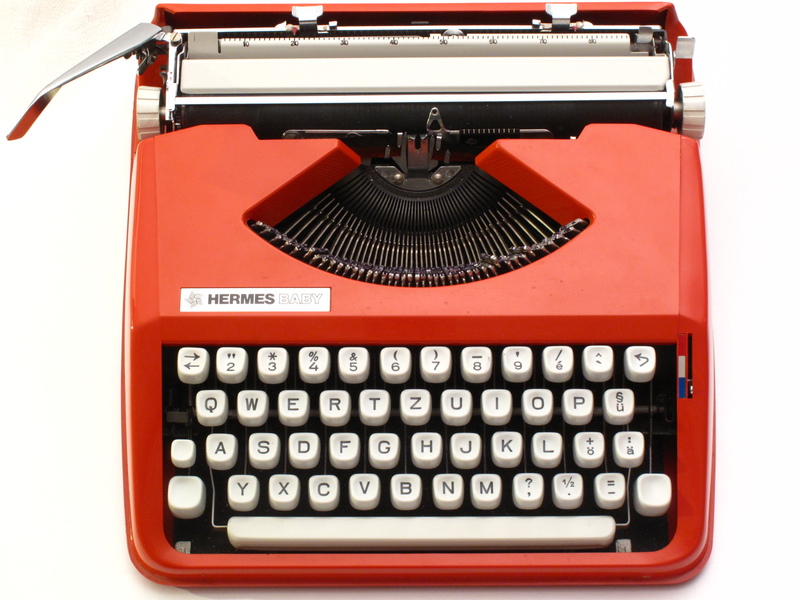 This Hermes 3000 looks familiar; I think it has been there for quite a while. Pity, it's in excellent shape and just begging to be used! An AZERTY Erika that was so dull it barely merited a picture, but I like to be thorough in my documentation. 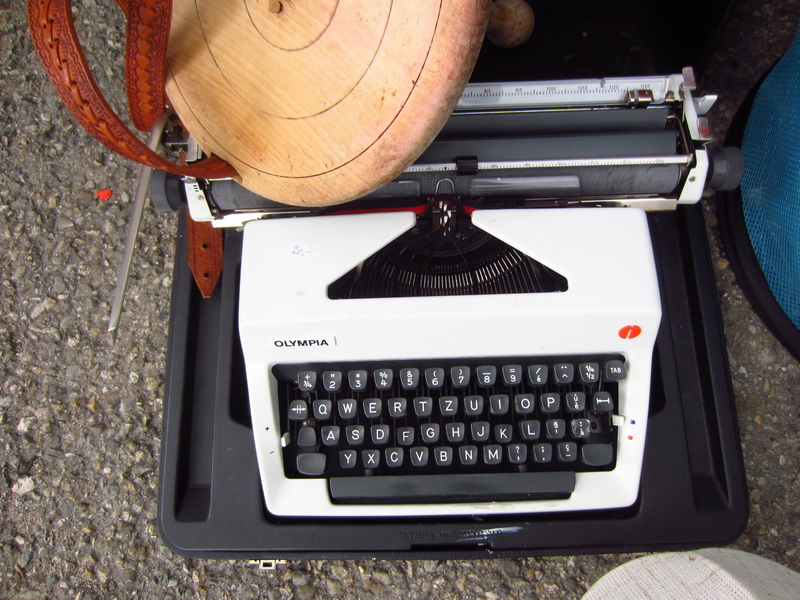 Back to the flea market, this lovely Olivetti M40 had a forbidding "do not touch" sign rolled into the platen. It took me a while to figure out what it was (since the paper obscures the badge) as I don't come across these often, if ever. 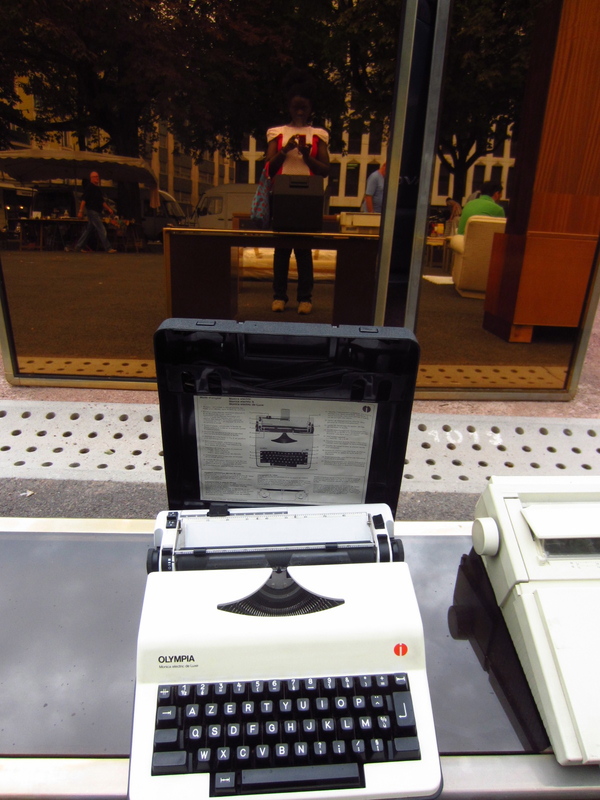 I cheated and nudged up the sheet when the seller wasn't looking... and there it was, Olivetti! Not as interesting but still worth taking a shot of was this Mercedes Standard. AZERTY though, ugh. And this darling "Darling" that was made by FAVTA AG of Frauenfeld, Switzerland, in the '50s as an Elna Grasshopper knockoff. Had to tear myself away from this one; it is just so adorable! This is the only part of the Fêtes I bother to take part in (not that I have much choice; we live too close to the fireworks to be able to tune them out, so we might as well watch! ); for the rest of the time I was too busy soaking in Olympic spirit. It's the only time I regret not having a TV, but online streaming from Television Suisse Romande worked remarkably well, thank goodness. Now off to catch up with my letter-writing - I am woefully behind!